IMA Active is pleased to invite you to the Open House which will be held at IMA North America in Leominster, MA (May 24 & 25, 2017). The event will give you the opportunity to share insights between the manufacturers and the industry, with the collaboration of IMA partners. 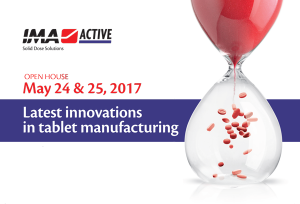 The central axis of the program will be based on the latest innovations in tablet manufacturing. Theoretical presentations and hands-on demonstrations will give you the opportunity to increase your understanding and practical skills.